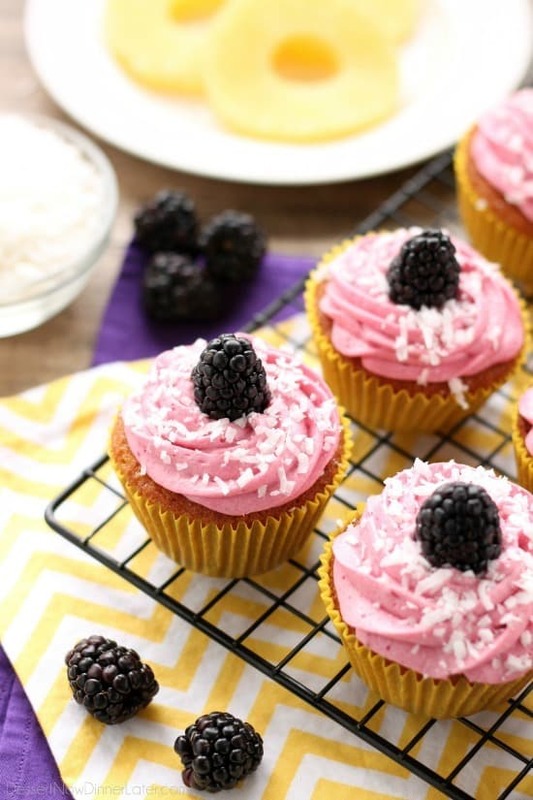 Piña Colada Cupcakes with Blackberry Frosting - Dessert Now, Dinner Later! 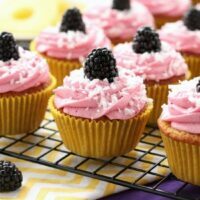 Blackberry Piña Colada Cupcakes – Moist coconut cupcakes with a sweet pineapple and rum filling topped with fresh blackberry frosting. 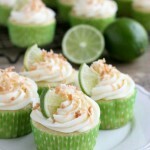 A delicious drink inspired cupcake with a twist! BIG NEWS! 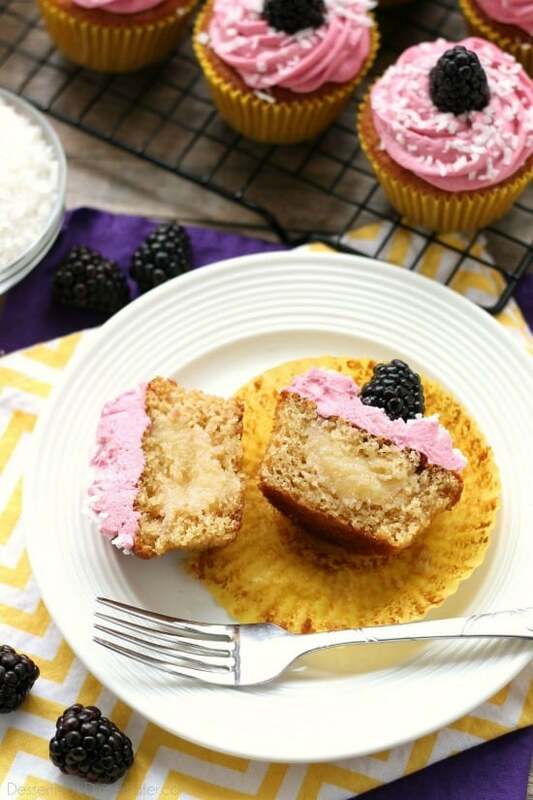 I attended Everything Food Conference over the weekend, where I got to compete in a mock “Cupcake Wars” competition with the previous Food Network Cupcake Wars host himself, Justin Willman, and this piña colada cupcake recipe with blackberry frosting was the WINNER! This cupcake competition was the highlight of the conference for me! It was so much fun! 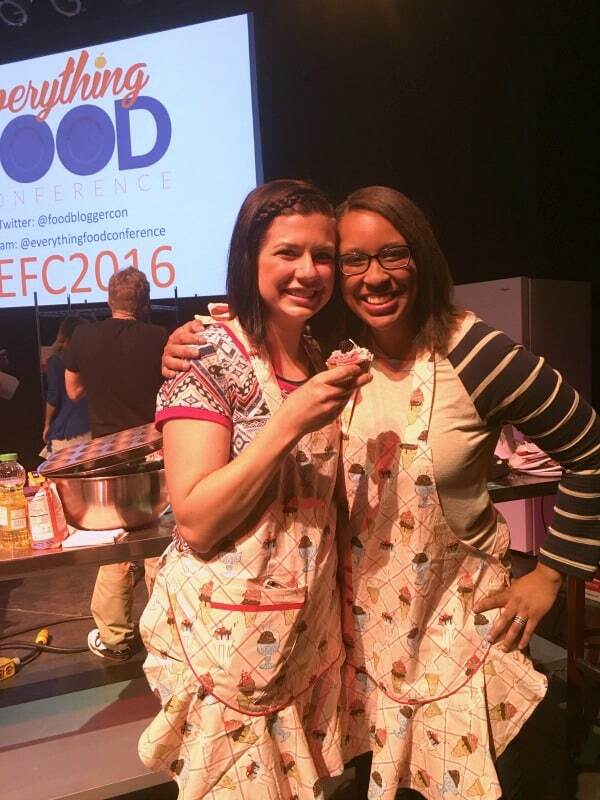 Yvonne and I wanted to create a cupcake we were proud of, and just have fun with it, so we were SHOCKED when we won! This piña colada cupcake with blackberry frosting was inspired by one of my favorite drinks from Chili’s that I recently learned they no longer serve (apparently it’s been a while since I’ve eaten there). Anyway, the drink was a (virgin) Blackberry Piña Colada. 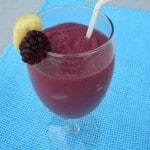 It’s just your normal piña colada, but with blackberries mixed in. Way back in the day I even posted a copycat recipe for it. 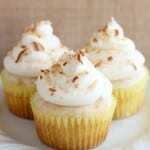 The cupcake itself has pineapple juice, coconut milk, and coconut extract, so it’s moist and tropical. Then I made a pineapple filling with a hint of rum extract that I put in the center of each cupcake. (This was my first filled cupcake, and I’m converted! I have to do more!) Lastly I made a fruity blackberry frosting. It’s just a great combo! WANT TO WATCH? Check out this video. Our judging starts around 19:47 if you want to skip ahead. I made a lighter version of the recipe below for my cupcake wars competition using Lite&Sweet, a xylitol and erythritol (two natural sweeteners) combo that works almost exactly like real sugar. It has a glycemic index of three (perfect for people with sugar intolerance), has 75% fewer calories than sugar, and is completely natural. It worked great! I’ll put my alterations in the notes if you want to try it. Because the original recipe I created uses brown sugar, I just added molasses to the Lite&Sweet for the same flavor profile. We also like the Lite&Sweet in our smoothies and herbal tea. The conference was so much fun! I’m definitely going again next year! In the mean time I have a few other business trips this year. I’m doing a food photography workshop in Minneapolis, Minnesota in July, so hopefully my photography will get much better. I really enjoy photographing food, I just feel stuck in a rut with the same props/angles, etc. Ready to be inspired! Two weeks after that I am going to IFBC (International Food Blog Conference) in Sacramento, CA. I’m pretty excited for that! I’m doing a pre-conference excursion for a Farm-to-Fork Adventure through Historic Sacramento Delta. I’m going to be learning a lot and eating great food! That’s for sure! 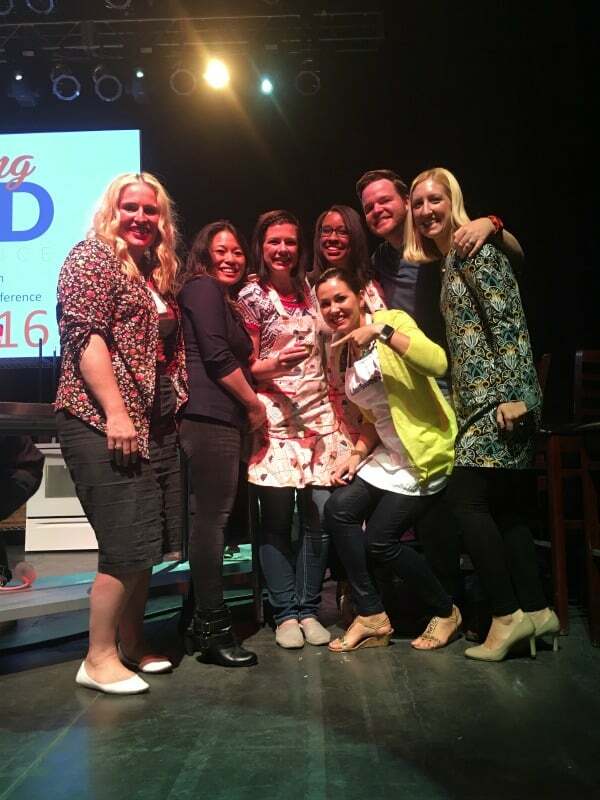 And last, but not least, I’m going to BlogHer Food in Austin, TX in October. I’ve never traveled out of state for blog conferences, so doing 3 out of state conferences in one year is going to be crazy, but fun! I can’t wait! 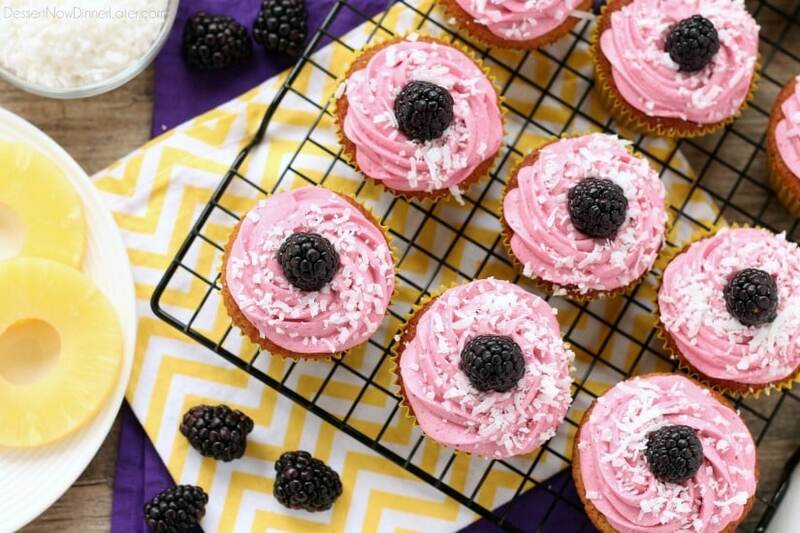 Moist coconut cupcakes with a sweet pineapple and rum filling topped with fresh blackberry frosting. A delicious drink inspired cupcake with a twist! Using a food processor, blend the coconut flakes into small pieces. Set aside for garnish. Rinse container for next step. Drain pineapple juice from the can into a measuring cup. SAVE the pineapple juice. Pour half of the crushed pineapple into the food processor and blend until smooth. (Save the leftover pineapple for smoothies, etc.) Pour pureed pineapple into a small saucepan. (Rinse container for next step.) Add the brown sugar, cornstarch, 1 Tbsp of the pineapple juice (or water), and ½ tsp rum extract. Heat until boiling and thickened slightly. Remove from heat, and allow to cool completely in the refrigerator. Blend blackberries in the food processor. Press mixture through a fine mesh sieve into a bowl. Set aside for frosting. Meanwhile, preheat oven to 375 degrees Fahrenheit and line a muffin tin with 18 paper cups. For the cupcakes: Using a stand mixer with the paddle attachment, cream the butter and sugars. Add the eggs, pineapple juice, coconut milk, and coconut extract. Mix well. Scrape the bowl. In a separate bowl, mix the flour, baking soda, and salt. Add to wet mixture all at once and mix until just incorporated. Use a #30 scoop and fill each muffin cup with a rounded scoop of batter (just over half full). Bake at 375 degrees Fahrenheit for 14 to 15 minutes, rotating the tray the last 4 to 5 minutes to cook the cupcakes evenly. Once the cupcakes have baked, remove them from the tin and allow them to cool on a cooling rack in the refrigerator. Meanwhile make the frosting. In the bowl of a stand mixer with the whisk attachment, whip the butter until smooth. Add half of the powdered sugar. Mix. In a small bowl mix together the blackberry puree, blackberry spread, and lemon juice. Add to the frosting. Mix and scrape the sides as needed. Add the remaining half of the powdered sugar until desired consistency. Mix well. Prepare a piping bag fitted with a Wilton 2D tip. Fill with frosting and set aside. Once the cupcakes have cooled completely, use a paring knife to cut out a circle/cone shape from the center of each cupcake. Set the cupcake tops aside. Place the pineapple filling in a sandwich size zip-top bag and cut off the corner. Pipe the filling equally amongst all 18 cupcakes. Place cupcake centers on top of the filling. Pipe frosting on the top of each cupcake, from the outside in towards the center. 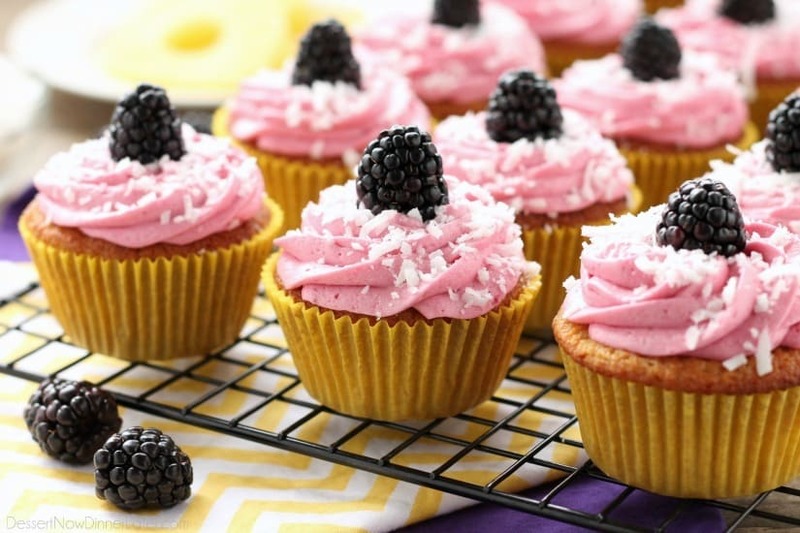 Sprinkle with coconut flakes and place a blackberry in the center of the frosting. Enjoy! *Store leftovers in an airtight container at room temperature up to 5 days. If using Lite&Sweet instead of sugar and brown sugar, use 1 cup Lite&Sweet in the cupcakes with 2 Tbsp molasses (for the brown sugar flavor). 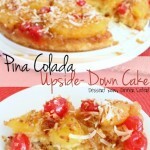 Also substitute 3 Tbsp Lite&Sweet in the pineapple filling with ½ tsp molasses. Follow directions the same. Way to go friend, so happy I got to do this with you! 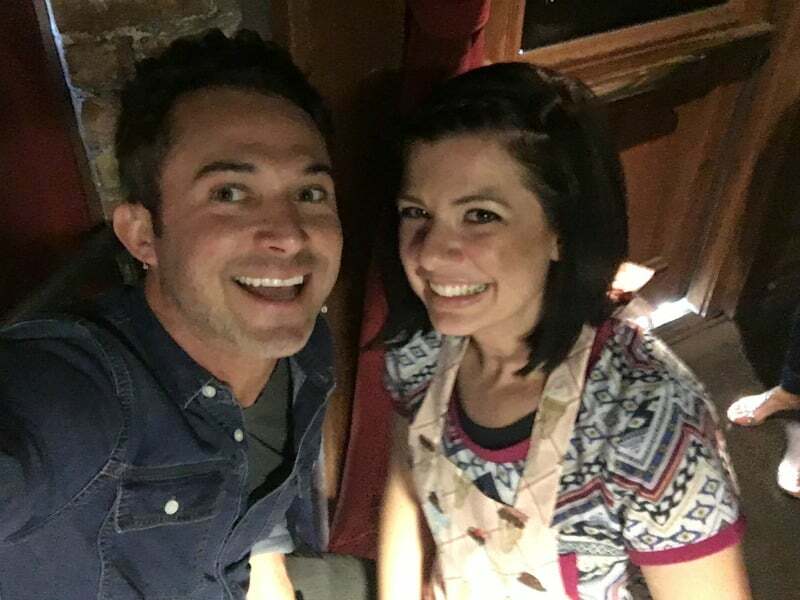 It was great to finally meet you, Amber! 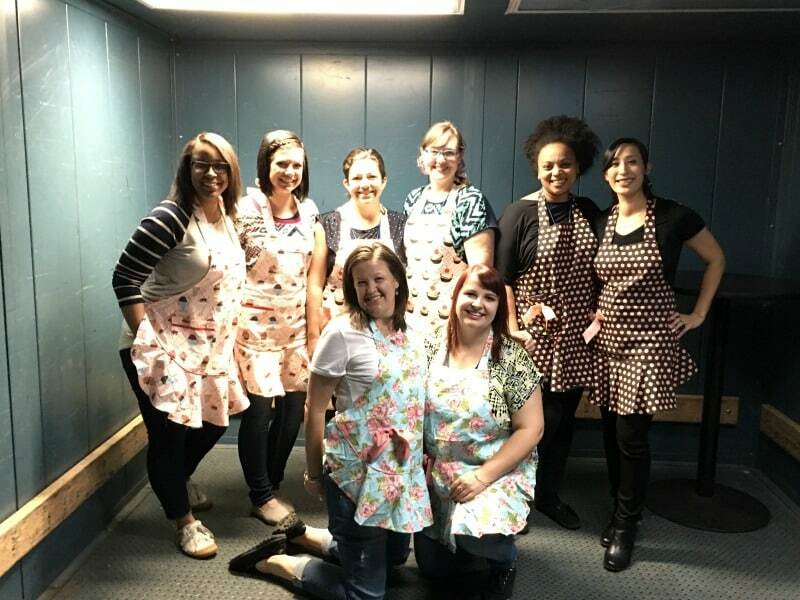 You all did such a great job with the Cupcake Battles, so happy for you for winning! These cupcakes are such a fun idea, I love that blackberry frosting too. Thanks Danielle! 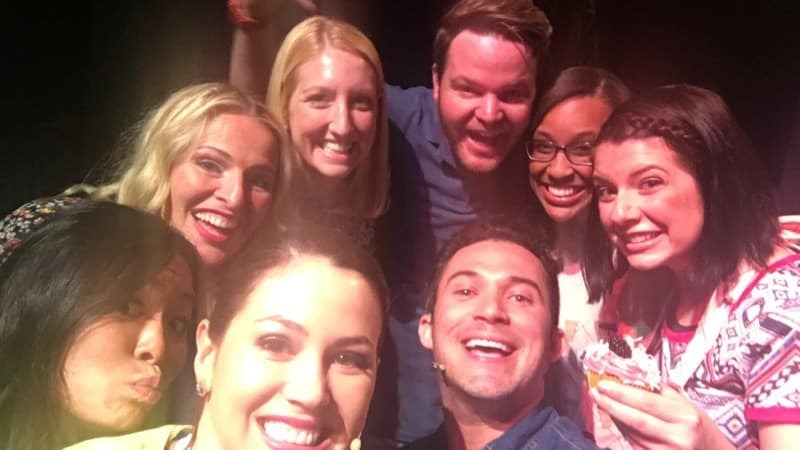 It was so fun meeting you too! It’s wonderful to meet your friends that you have online face-to-face! I feel like I perfected that blackberry frosting, so if you try these, I hope you think so too! This was so much fun! I did not know anyone had a video of it- I can tell how nervous I was while trying to play it cool. Congrats you guys- you definitely had the tastiest cupcake!! See you next year for THE REMATCH.